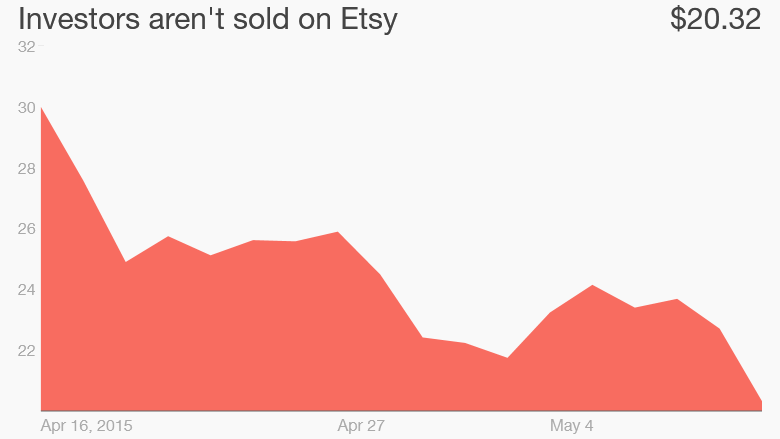 Etsy, the online marketplace for crafts, is seeing a lot of selling Monday. But this isn't a run on jewelry and hand-made blouses. Investors are dumping the stock after a Wall Street analyst warned that as many as 2 million items for sale on Etsy -- about 5% of all the goods on the site -- could be counterfeit or violate trademark laws. Etsy (ETSY) stock plunged over 8%. It's the latest blemish on a company that went public with a big IPO less than a month ago. The stock closed at $30 on its first day of trading on April 16. Now it's barely above $20. From the start, there were concerns about how Etsy could grow into a behemoth online retailer along the lines of eBay (EBAY) or Amazon (AMZN) given that Etsy's focus is all about hand-made and niche goods. Think of it as a giant craft fair. Some also questioned whether Etsy was "selling out" to Wall Street and would lose its alternative image and customer base. But a new report from research firm Wedbush layers on even more doubts about Etsy's ability to grow the business. Wedbush highlights numerous instances where Disney, NFL and Louis Vuitton brands could potentially sue for copyright infringement. The researchers compared Etsy's potential pitfalls to the problems Chinese online retailer Alibaba (BABA) is having in fighting counterfeiters and trying to maintain a clean image. "Considering the broad backlash on Alibaba regarding inauthentic merchandise, we expected added scrutiny given the social responsibility ethos at the core of Etsy's brand," the report noted. Etsy did not respond to CNNMoney's request for comment. Some sellers would likely be protected under the Fair Use law that allows artists to use brand images if they are "sufficiently transformed." Wedbush set its price target to a mere $14 for the stock. That would be even lower than the $16 a share IPO price. 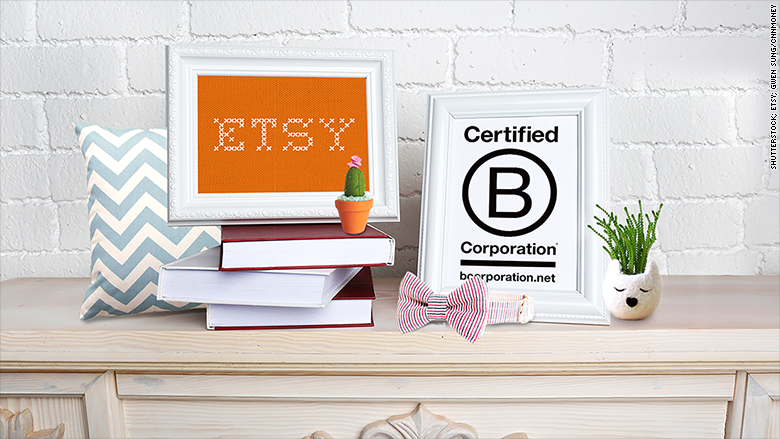 "Brands increasingly pursuing sellers on Etsy could materially reduce listing fees and commissions," Wedbush wrote. Before Monday's stock price drop, Etsy was trading at an extremely highly valuation level that even outpaces high-growth Internet companies like Alibaba and Twitter (TWTR).